I like carrot cake, so when I saw this recipe for carrot cake cookies on the excellent delish.com website, I couldn’t resist it. Now, whether I can actually successfully make the cookies is another question entirely . . . .
Preheat oven to 350 degrees. Line a baking sheet with parchment. Beat butter and sugars until light and fluffy. Add eggs, one at a time, until incorporated, then add vanilla. In a separate bowl, whisk together flour, baking soda, cinnamon, nutmeg, and salt. Add dry ingredients to butter mixture until well-combined. Stir in carrots, coconut, raisins, and oats and mix until just combined. Scoop 1-inch rounds of dough onto baking sheet. Bake until golden, 13 to 15 minutes. Let cool. Beat together cream cheese, powdered sugar, milk and vanilla until combined. Drizzle glaze over each cookie and let harden before serving. Last night Kish and I and Mr. and Mrs. JV attended the Columbus Gay Men’s Chorus holiday music show. Entitled Joy! “Set the Earth Aglow,” it featured performances by the Chorus as well as Illuminati and Vox, which are two other choral groups, all backed by a piano, horn and violin sections, drums, and bells. I love holiday choral music, and the Chorus show offered a good mix of traditional and new offerings. I particularly like The Yearning, a beautiful piece I’d never heard before, the toe-tapping Oba Se Je, a fine rendition of songs from the Beach Boys’ classic Christmas album, and Recycle The Fruitcake, a rollicking comic triumph. The show closed with audience participation in singing The Little Drummer Boy. It was an excellent performance that really put me in the Christmas mood (and made me think that I need to get cracking on my holiday baking, too). 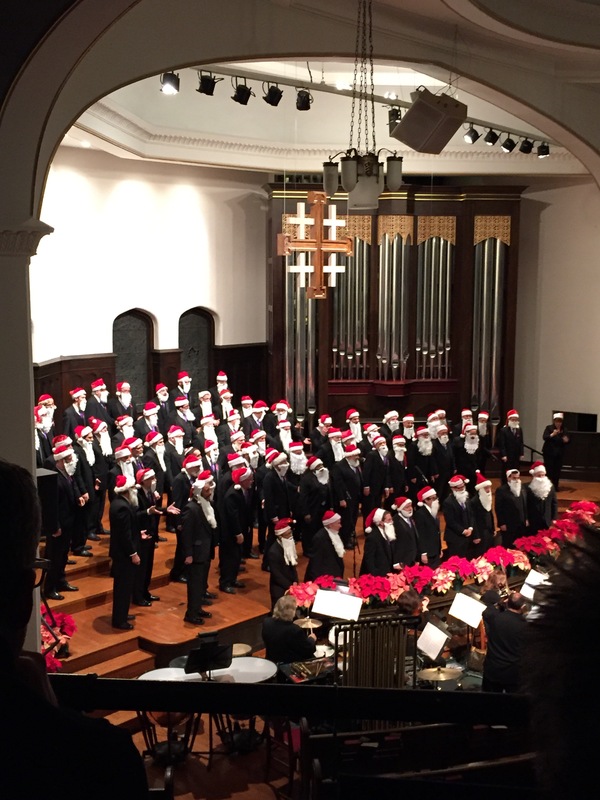 If you want to kick start your holidays and watch some guys who obviously enjoy singing and are having fun doing it, you can catch two other performances of the program, today and tomorrow, at the King Avenue United Methodist Church.